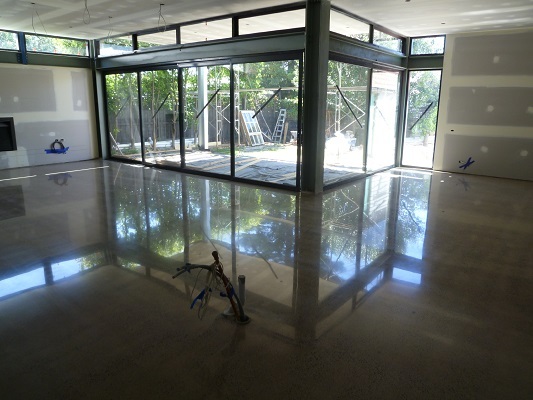 Polished Concrete Malvern – From Soil to Shine! Start with some soil, lay a high quality concrete slab, and make it shine – like this new construction – with polished concrete Malvern. A huge room with loads of natural light makes the high gloss finish on this polished concrete Malvern pop – a beautiful foundation for a brilliant living space. The sunlight pouring through the windows creates a mirror effect, and the result is a room that looks even bigger than it is already! Getting the best results from your polished concrete Malvern depends on the quality of your slab. So, starting from scratch means you can lay a great slab that ensures a top finish. When it comes to making your home cosy and warm, it might surprise you to find that concrete can be sunlight’s best friend! If your concrete floors have direct access to sunlight, the concrete acts as a thermal mass. This means it stores the sun’s warmth and radiates the heat over time. With that in mind, check out the incredibly large window surfaces in this living space. Imagine how much sunlight the owners of this property will enjoy, and how much radiant heat it could generate! They also included a stunning gas fireplace to add ambience and extra warmth. Click here for more information about the warming advantages of polished concrete. 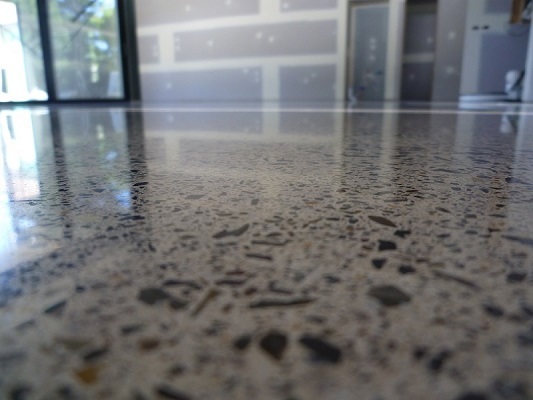 The aggregate in this polished concrete Malvern has a light random exposure and a sandy tone, which gi ves it a soft, natural feel. Located in the inner suburbs of Melbourne, this is a large area that lends itself well to entertaining. We’re sure that the open plan living space will be home to many a gathering. It makes sense to choose flooring that is easy to maintain, flooring that will cope with a significant amount of foot traffic. And the on trend flooring doesn’t end here. This random exposure high gloss finish continues through other parts of the home, including the hallway. As a suburb, Malvern is in high demand! Quality restaurants, shopping, parks and gardens, it also boasts ample access to public transport and schools. Homes in this area are known for their high end finishes. So polished concrete floors are a superb choice to complete your home, and just as brilliant for resale. 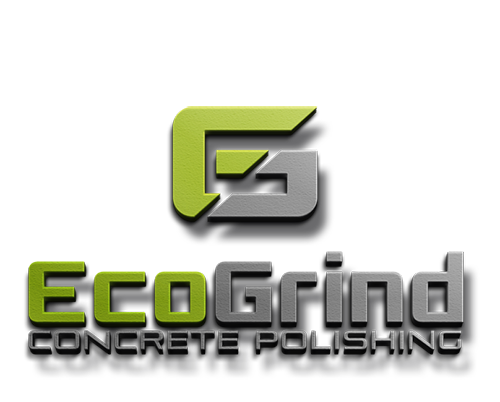 Eco Grind are the polished concrete Malvern experts. 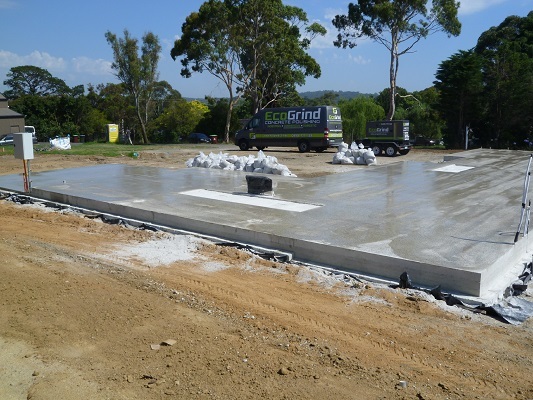 Whether you’re starting from scratch with a patch of soil, or have a tired-looking, yet solid foundation in your existing home, Eco Grind are the team to call. Contact us today for an obligation free quote. We know how to give your home an extra shine that will be the envy of everyone!